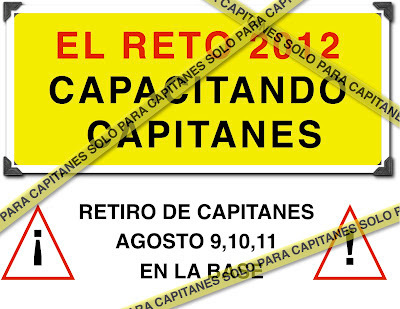 "EL RETO 2012: CAPTAINS TRAINING RETREAT"
This year we will spend three days training the six captains and three co-captains preparing them for leading teams, working with people, and accomplishing tasks. It will be an exciting time of fellowship, Worship, Teachings, and some very practical objectives for them to accomplish and learn from. We are excited about this and look forward for God to do some excellent things in their lives! Please keep Alfredo, Jorge, Francisco, Andrés, Jamín, and Karolina in your prayers.